Choosing the Right Targets and Metrics - SKMurphy, Inc. The targets that founders set for a startup, and the metrics they choose to measure their progress toward these targets, are key decisions in the definition of the business. The wrong targets–in particular selecting only targets that are easily achievable–will not only postpone difficult choices that will bring clarity but may doom a team from the beginning if they don’t adjust and aim for outcomes that create a sustainable and growing business. In the early stages of a startup it’s difficult to measure progress purely by revenue or customer satisfaction. You have to measure intermediate outcomes: prospects open our emails, visit our website, and sign up for a demo, webinar, or newsletter subscription. These may be necessary but they are not sufficient to closing deals and creating value and satisfied customers. One risk is that you can get trapped increasing these intermediate metrics without actually advancing the sale. In effect, you are planting seeds but failing to water: plants may sprout but then exhaust what little moisture is available to them and die. Planting more and more seeds without understanding how the soil needs to be prepared beforehand and what irrigation and other nurturing may be required (e.g. weeding, protection from sun, fertilizer, etc..) will only lead to more sprouts that fail to thrive. But instead of analyzing why the sprouts are failing you think that if with enough sprouts some will thrive–that this time will be different. Attracting more and more visitors to your site, while it is necessary to start generating revenue, is not sufficient to create a sustainable business, much less a growing one. You are missing the other nurturing activities. There is a trap where you celebrate hitting the early targets (e.g. they visit your site and fill out a from or they not only open but they reply to an e-mail) and focus on increasing those metrics hoping that if you have enough interest someone will be willing to pay for your product. William Eleazar Barton offered an interesting perspective on getting trapped hitting the easy targets in “The Seven Targets” in the “Parables of Safed the Sage” (1917) , I have excerpted the relevant text in the next section. NOW in the City where I dwelt were diverse Shooting Galleries, and some of them charge Five Cents for Three Shots, and there were others that Gave Five Shots for Five Cents. And I Noticed when I passed their gates, and if the Sign Read Three Shots for Five Cents, I entered Not; but if it Read Five Shots for Five Cents, then I entered. And one of the Galleries where I went had Seven Targets, all in One Row. And the Targets had each of them a Bullseye. And the Targets were each of the Same Size, about a Cubit in breadth; but the Bullseyes were Diverse. 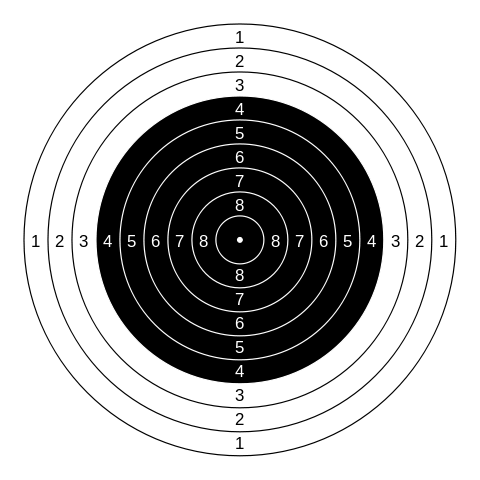 For the one on the Right hand had a Bullseye as small as the Fingernail of a man’s Hand, and the one on the left had a Bullseye as large as a Silver Dollar, and those that were between Grew as the Targets were placed from the Right side to the left. 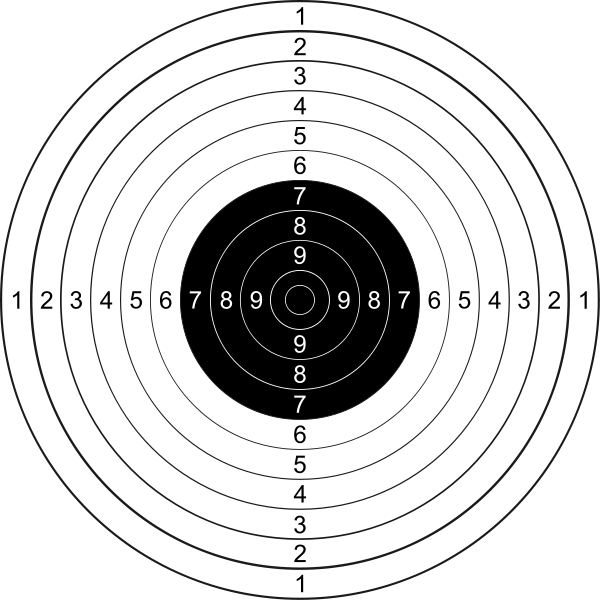 And there were on each Target Rings round the Bullseye, from the Bullseye to the Outer Edge of the Target. And he who Hit the Bullseye on any Target whatsoever caused a Bell to Ring. Now, in my Youth I could Shoot Some, and in my Riper Years I can Shoot a Little. So it was my custom to Choose a Target near the Middle, and Sometimes I made the Bell to Ring, perhaps twice or thrice out of Five. But it came to pass on a day that I entered a Gallery, and laid down a silver Coin which was the Fourth Part of a Dollar, and the Man gave me Four Nickels and a Gun. And I took the Gun, and I Said, I have not practiced of late; I will take the Large Bullseye. So I shot, and I Hit It. And I shot again, and I Hit it Again. And thus I did Five Times. And it Pleased me that I had Hit the Bullseye and Rung the Bell Five times. And I handed the Man another Nickel, and I Hit the Bullseye Five Times More. And I was yet more pleased. And I gave him Another. Nickel, and Yet another Five Times I Did the Same. And I said within my heart, Behold, am not I a good Shot? And I gave him Another Nickel. Now if all you want is to Hear Yourself Ring the Big Bell, you can Probably Continue to Do That for a Considerable Time to Come; but if you really want to Improve Your Shooting, you will never shoot at anything but the Smallest Bullseye. You will put your shots into quite as Small a Circle, and you will have the Advantage of Knowing Just How Much you lack of Being a Really Good Shot. And the word went to my heart. So I walked to the other end, and I shot five times at the Small Bullseye, and I hit it Not Once. But all my Shots were close in, and every one of them would have Bung the Big Bell. So I gave him my Last Nickel, and I Shot Five times more and out of the Five Shots I Rang the Small Bell Twice. And though it sounded not so loud as the Big Bell, yet I knew in my heart it was Better Shooting, and that it had Compelled me to do My Best. These are are important milestones in a sales process but are not enough. Action: form fills or sign-ups for white paper, e-book, demo, webinar, newsletter. Feedback: prospects supply critique, test data or benchmarks. Product Use in a sandbox, trail period, or proof of concept (POC). Feedback and use are key milestones because that enables you to have real conversations and start to refine your understanding of customer needs. Real conversations require you to actively manage expectations and listen for what is not being said. These metrics allow you to substantiate that you have a working customer discovery process, the trust of your customers, and proof that you are delivering value. The perspective to adopt is to stand in your customer’s shoes and assess the value you are creating and the risks and costs you are imposing on them. Focused execution against a clearly defined set of targets is necessary but not sufficient, you must improve you ability to discern targets and determine if you are talking to a real prospect. Getting better at diagnosis requires you to invest effort in improving your discovery skills through deliberate practice. Here is a succinct example of deliberate practice. Q: Can you explain how deliberate practice works? Real expertise produces concrete results. Brain surgeons, for example, not only must be skillful with their scalpels but also must have successful outcomes with their patients. A chess player must be able to win matches in tournaments. The third test, repeatable performance, means that you should be able to develop checklists and heuristics (rules of thumb) for each phase of your customer engagement process from targeting to early conversations to closing the business to demonstrating value and eliciting repeat orders, case studies, and testimonials. It also encourages you to declare victory early or define early outcomes as successful instead of persevering to establish sustainable business relationships.